Frank Jay Haynes (October 28, 1853  March 10, 1921) was a professional photographer, publisher and entrepreneur from Minnesota who played a major role in documenting through photographs, the settlement and early history of the great Northwest. He became both the official photographer of the Northern Pacific Railway and of Yellowstone National Park as well as operating early transportation concessions in the park. His photographs were widely published in articles, journals, books and turned into stereographs and postcards in the late 19th and early 20th century [from wikipedia]. 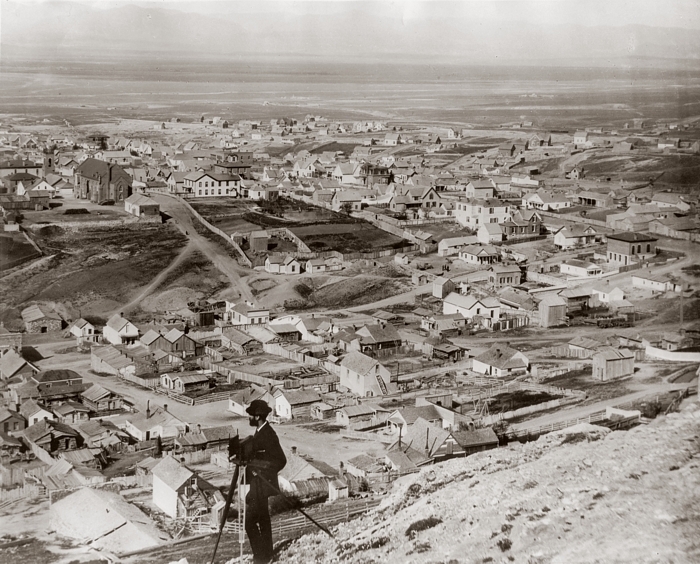 This 1883 photo looks northeast from the hillside above Pine Street, across "Catholic Hill" and into the valley beyond. An annotated version of this photo is in the works. One interesting feature is the open reservoir just south the first St. Vincent's Academy. It was constructed by the City in the 1870s to provide a reliable source of water for fire-fighting. It was filled-in and landscaped after water mains and hydrants were put in place.